The first dose of varicella vaccine is administered at age 12-15 mos. based on PhilVacc immunization schedule, for some reason, my child had his first shot just today. (Well, Doc determines which is the the best schedule to give for every child, case by case). We are originally sked for flu vacc but it was still not available as of this time. I don't know if there's still a problem on manufacturer because there's a certain report last time that fake flu vacc was out of the market, so we are cautious to have it. And so we've waited, but until now there's no release yet. We arrived just on time to be the number 2 patient, and so the usual scenario of waiting for Pedia Doc for almost an hour rewinds. While waiting, my child plays around and we find it hard to make him just sit down in a corner and behave. A mommy on my side talked to me asking if my child was already on school, I said not yet, and she replied: "kaya pla". I explained my side that its too early for him to go to school since he just turned 2, but she say that her child started early as that. I guess thats "Play school for toddlers". I don't know what I felt as she emphasizes that a child needs to learn how to socialize. To be honest, I felt awkward about it, as if she's trying to bring it as: "Have your child learn to socialize", as if its not normal for him to behave that way. My first impulse was not to get so much weight on what she's trying to imply (if i'm not getting it wrong!). Enough for that (toinks! 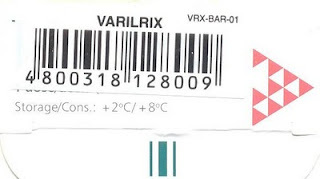 ), Varicella Vaccine here we go... Super "hold" on my toddler's arms and legs as Pedia Doc aims for his right leg. A short scream was heard and that's it! It's not 100% assurance of not having chicken pox but definitely a way of prevention from any related disease such as 'shingles' - (also termed herpes zoster) is a disease caused by reactivation of the herpes zoster virus (varicella-zoster virus, or VZV) that results in a painful localized skin rash, usually with blisters (fluid filled sacks) on top of the reddish skin. It costs us 2,200 pesos, not much for an added protection for my child from the worst of this illness. While the vaccine isn't 100 percent effective (about 15 percent of vaccinated children still get chicken pox), vaccinated children who come down with it will have only very mild symptoms. That usually means fewer than 50 blisters, no fever, and less sick time. A much less severe case! a much less... that makes the vaccine a requirement for every child.